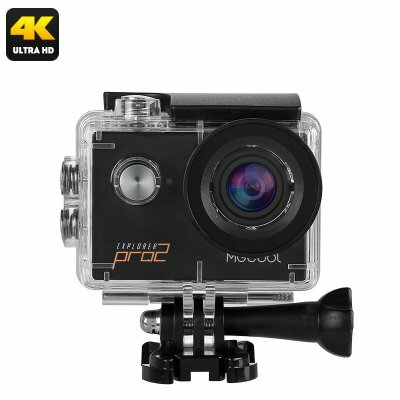 Successfully Added MGCOOL Explorer Pro 2 Sports Action Camera - Sony IMX179 CMOS Sensor, 6G Sharkeye Lens, 2-Inch Screen, 4K Video, 16MP Pictures to your Shopping Cart. At the rear of the MGCOOL Explorer Pro 2 action camera, you’ll find a 2-Inch touchscreen on which you can instantly watch back your recordings. With its APP and WiFi support, your sports action camera allows you to easily share footage straight onto your smartphone or tablet. All the recordings made with this 4K action camera are guaranteed to be of the highest quality imaginable thanks to the camera’s 6G ''Sharkeye'' lens. Along with a 170-degree viewing angle, not a single detail will stay uncaptured with this stunning 4K sports action camera. The MGCOOL Explorer Pro 2 action camera comes with a 12 months warranty, brought to you by the leader in electronic devices as well as wholesale electronic gadgets..